Bryce Harper spoke outside of Independence Hall as part of the Phillies' announcement that they're hosting the 2026 MLB All-Star Game. 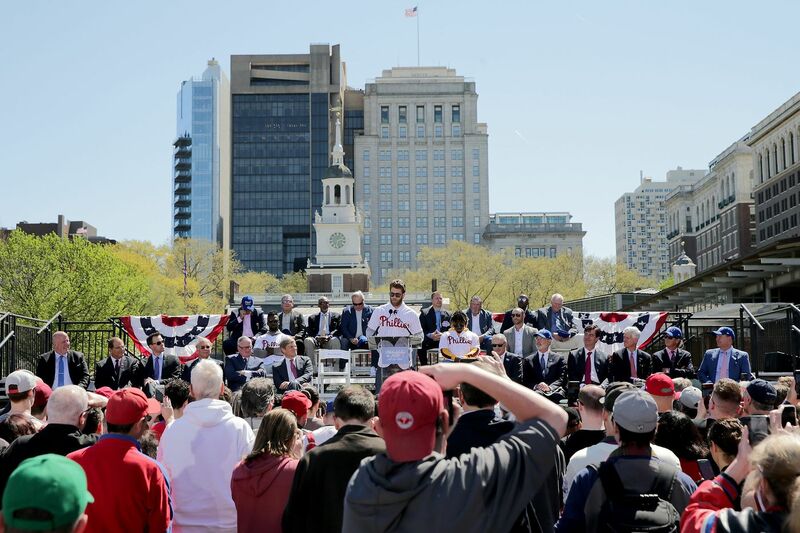 Between the politicians and other dignitaries, the league and team officials, and the current and former Phillies players and managers, there were 26 people seated on the makeshift stage in front of Independence Hall. But the man who was most responsible for bringing them all together was absent. Philadelphia will host baseball’s 2026 All-Star Game, “one of the worst-kept secrets in America,” Major League Baseball commissioner Rob Manfred joked on Tuesday, as he made the announcement at a news conference. It will mark the city’s fifth Midsummer Classic, following the 1943 and 1952 games at Shibe Park and the 1976 and 1996 games at Veterans Stadium. It’s unusual for MLB to choose an all-star game site so far in advance and before the previous five years’ games are awarded, Manfred acknowledged. The league has its reasons, though, principally because Philadelphia is a logical location to help mark America’s 250th birthday. And by announcing it seven years in advance, MLB could help the city lure other marquee events for the Semiquincentennial, just as it did for the Bicentennial in 1976. But there was another reason to do it now. The idea was the brainchild of Phillies chairman David Montgomery, who first mentioned it to Manfred a few years ago and hasn’t relented, even through his fight with jaw bone cancer. And if there’s one thing that Manfred has never been able to do, it is saying “no” to Montgomery. Manfred has known Montgomery for 30 years and described him as "one of my best friends in baseball." Manfred said the 72-year-old was an early career "mentor," and as a member of the selection committee, he played a role when Manfred was elected as commissioner in 2014. "He helped me understand how the game operated," Manfred said. "Young people often lack a little patience. He taught me to be a little more patient than I probably was with my disposition." Manfred recognized the irony in Montgomery’s reaction when the commissioner told him that MLB was going to award this All-Star Game to Philadelphia. There are logistical issues to announcing an event so far in advance. For instance, there might be new hotels in Center City by 2026, and some of the existing hotels could be gone. There’s time, though, to deal with those situations. One likely constant for Philadelphia over the next seven years: Bryce Harper. By 2026, the Phillies’ new superstar will be little more than halfway through his 13-year, $330 million contract. And if the six weeks since he signed as a free agent are any indication, he will be ingrained in the city’s sporting culture. Harper wore custom-designed Phanatic cleats on opening day. He bows to the fans in the right-field bleachers before every game. He even rang the bell at one of the Sixers' final regular-season home games. Manfred said MLB doesn’t typically begin promoting an all-star game until one year before the event, but the league probably won’t need to search hard for a Phillies player around whom to build their 2026 All-Star marketing campaign. "Let’s hope he gives us a home-run derby like he gave us in Washington last year," Manfred said. "That would be great." Indeed, Harper has been the face of the Midsummer Classic before. After declining to participate in the home-run derby at other All-Star Games to build up the drama for last year’s event at Nationals Park, Harper thrilled the home crowd by winning the derby. "There's nothing more exciting than going to an all-star game and enjoying it with some of the best players in the game," Harper said. "I can't really explain how exciting it is to be in the home-run derby, to be part of the [pregame] parade. Just for the city and the fans, you guys are going to enjoy it so much." Middleton predicts it will be "a massive party in Philadelphia for about a month before and after." The commissioner is just glad that his old friend brought it up.